"the failure of many investigators to induce experimental cancers, except in a handful of cases, during fifty years of trying, casts serious doubt on the validity of the cigarette-lung cancer theory." At the time, 27 human studies had already established a clear link between smoking and cancer. Today, in spite of reams of data establishing the tobacco/cancer link, the industry still conducts tobacco testing on animals, spending millions of dollars and killing hundreds of thousands of animals in an attempt to manipulate data. Tobacco testing on animals has been illegal in Britain since 1997. Dr. Auerbach, a pathologist and Senior Medical Investigator at the Veterans Administration (VA) Hospital in East Orange, New Jersey, conducted experiments on beagle dogs from 1967 to 1970. 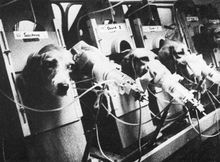 The first experiment utilized twenty beagles, who were reportedly subjected to "debarking" (surgical removal of tissue from the vocal chords) to keep them quiet in the laboratory. The dogs were also given tracheotomies (surgical openings in their windpipes) into which tubes were inserted. Lab aides periodically placed a lit cigarette, without a filter, at the other end of the tube. The beagles were made to puff between six and 12 cigarettes per day, an amount experimenters judged to be the equivalent to smoking 1-2 packs/day in humans. A laboratory aide would attend each dog while they were smoking. Some of the dogs became addicted to nicotine. One displayed withdrawal symptoms when cigarette smoking was discontinued. Some of the dogs reportedly became so addicted to the administration that they wagged their tails and jumped into the smoking box (according to a report in a medical journal by the experimenters). The experiments were financially supported by the VA and the ACS. 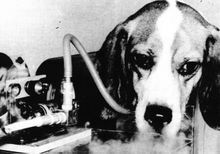 The "smoking beagle" experiments continued for four years and were widely protested as animal cruelty. The National Catholic Society for Animal Welfare placed advertisements in newspapers throughout the U.S. protesting the experiments. The ads showed one of the beagles exhaling cigarette smoke while hooked up to a smoking machine. The caption said, "They cannot protest. They cannot escape. They are defenseless against the demands of science." The ads encouraged readers to contact their congressmen to ask them to stop the experiments and thousands responded. Dr. Auerbach defended the experiments, claiming that it would take 20 years worth of human studies to determine if filtered cigarettes were safe, as opposed to 18 months worth of dog experiments. Although he had already (along with many others) established a clear tobacco/smoking link through pathology and clinical studies (see also Oscar Auerbach), apparently, the focus of this particular study was to determine whether filtered cigarettes were "safe". It is not clear how such a notable difference in physiology (18 months as opposed to 20 years) would be an advantage, let alone valid and applicable to humans. Nor is it clear how severely mutilated beagles, subjected to not one, but two surgical procedures (often severely debilitating in themselves) smoking cigarettes through tubes inserted into tracheotomies, demonstrated this purportedly successful outcome. Never-the-less, according to the ACS, the results refuted contentions from tobacco interests that there were no cigarette-cancer links and claims to the contrary were only "statistical." Animal testing has many advantages for the researcher, the tobacco and other industries. He or she has has virtually complete control over powerless, expendable and often silent (debarked), subjects. Published results are conveniently and profitably churned out in a few months or years. Results of animal experiments are open to interpretation and are therefore, easily manipulated. Researchers are free to use and kill subjects (over 90% of which do not even have to be reported)  until desired results are achieved or even to refute human studies and perpetuate confusion. Media accounts often depict vivisection issues as "animal rights vs. science". Endless pseudo debates and straw man arguments provide convenient smokescreens for flagrant welfare violations and hostility to reforms. In other industries as well, they provide a smokescreen for incompetence, inefficacy and damage to human health. For example, the practice of product testing by pharmaceutical and chemical companies has been regularly criticized by the medical and scientific community as unscientific and dangerous to humans. However, reporters receive "news handouts" from laboratories and report them without question. ,  See also animal testing, sections 1 through 3. Animal researchers sometimes publish in hundreds of journals, much to their professional and financial success. There is also a huge and profitable industry built which includes animal breeders, suppliers of cages and equipment designed specifically for animal testing. A 2001 audit for 30 facilities revealed that approximately 56% received over 100 million per year from the NIH for animal research. See also NIH. "...all the useful evidence we have accumulated about cancer has come from human studies. The links between chemicals, x-rays, foods, and asbestos on the one hand and different types of cancer on the other hand were all obtained after doctors had studied human patients. Instead of helping, animal experiments have consistently slowed down the speed with which these essential discoveries have been accepted. This page was last edited on 11 December 2015, at 16:02.